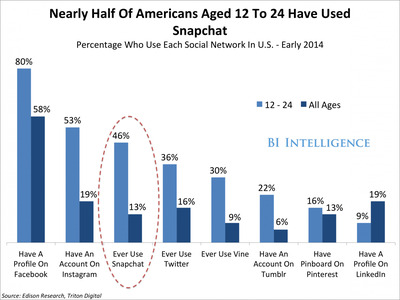 Snapchat is already incredibly popular among teens, young adults, and brands for sharing photos and videos. But now the company will let its users send money to one another within the app via a new peer-to-peer payments service called Snapcash. Given Snapchat’s popularity, especially among a similar demographic as peer-to-peer payment service Venmo, this could be an incredibly successful service. 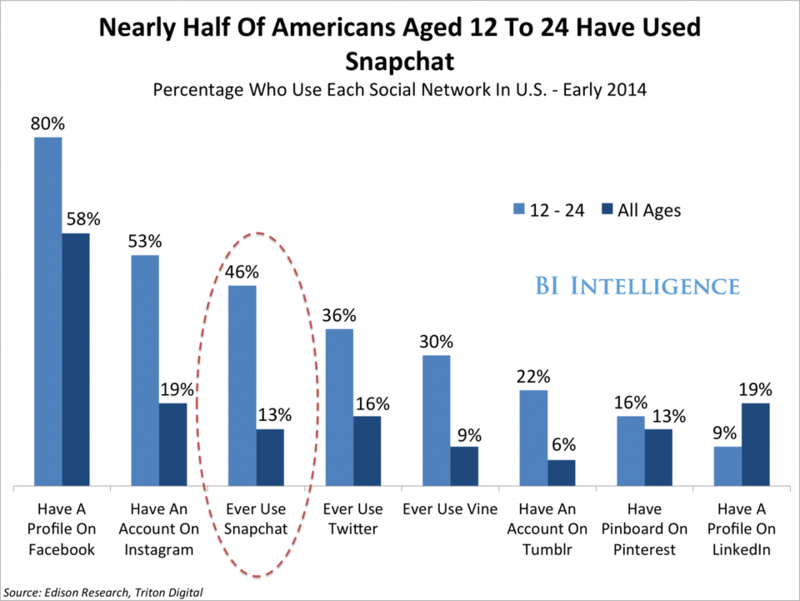 In a recent report from BI Intelligence, we break down all the numbers and user trends that explain why Snapchat is so popular, particularly among teens and college kids. 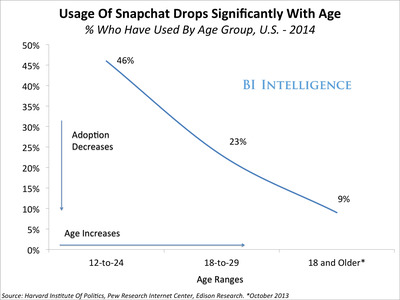 Snapchat is powerful in part because of its unique demographics. Snapchat’s users are majority female, and most users are between the ages of 13 and 25, according to press reports, based on statements from Snapchat’s executives. 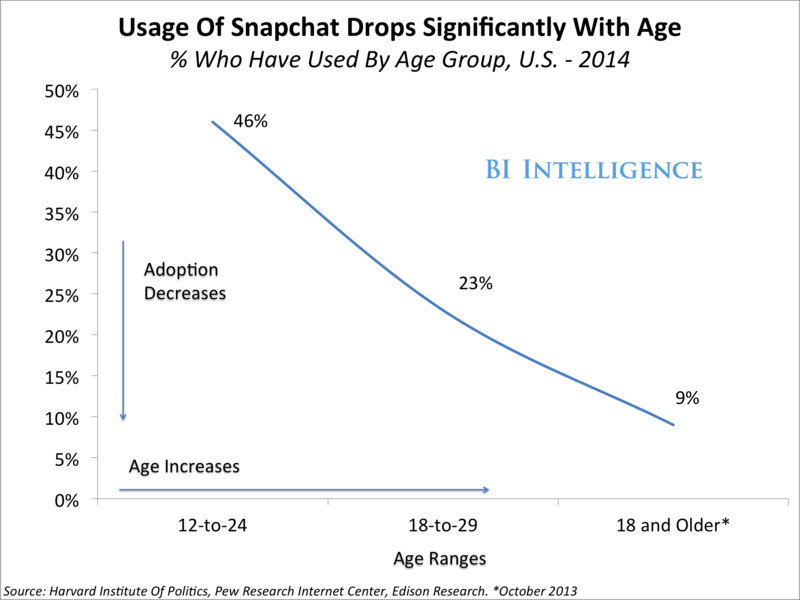 We provide detailed estimates of Snapchat users’ demographic profile, using data from several sources. Young women are a difficult-to-reach and influential demographic. Engagement is high: Two-fifths of 18-year-olds in the U.S. use it “multiple times daily” to communicate with family and friends, according to a survey published earlier this year. That’s a higher proportion than those saying they use voice calls multiple times daily. It’s a global phenomenon. Snapchat has reached a top three rank in the iPhone app store in many of the world’s wealthiest and most developed consumer markets, including Sweden, France, Australia, Norway, Canada, and the U.S. and U.K.
Snapchat is much more than disappearing photos. It has introduced several marketer-friendly features in the last eight months, including videos known as “Snapchat Stories.” The app’s millions of users can weave together collections of photos and video into stories. Brands, too, have been quick to adopt stories. Like with TV ads, brands can make their stories 30- or 60-seconds long, a comfortable and familiar format for advertisers. Also, Stories don’t disappear after a few seconds. They can be watched again and again in a 24-hour period. Brands are increasingly active on Snapchat . We also look at what major brands including Audi, Taco Bell, Grub Hub, Audi, Mashable, McDonald’s and streetwear retailer Karmaloop are doing on Snapchat. Also notes usage by publishers like Mashable and institutions like the University Of Michigan. Snapchat does pose certain disadvantages. It is difficult, though not impossible, to build a large audience on Snapchat. To do so usually requires heavy cross-promotion on other social networks. For full access to all BI Intelligence’s reports, briefs, and downloadable charts, sign up for a trial membership.